The entrees we chose were the Argentinian Pan Roasted Organic Chicken Chimichuri (middle left pic)- with roasted potatoes, seasonal vegetables and pine nut chimichuri sauce; the second entree was Bistro Prime Cheese Burger (middle pic)- comes with caramelized onions and raisins with their house flavor spread. This burger was humongous! I needed a fork and knife to eat it. There weren't too much raisins and it blended well with the sauce. For dessert, my husband got a slice of key lime pie (middle right pic) and I got the Tarte Tartin with vanilla ice cream and strawberries (bottom pic)- this dessert is an upside-down tart in which the apples are caramelized in butter and sugar before the tart is baked. 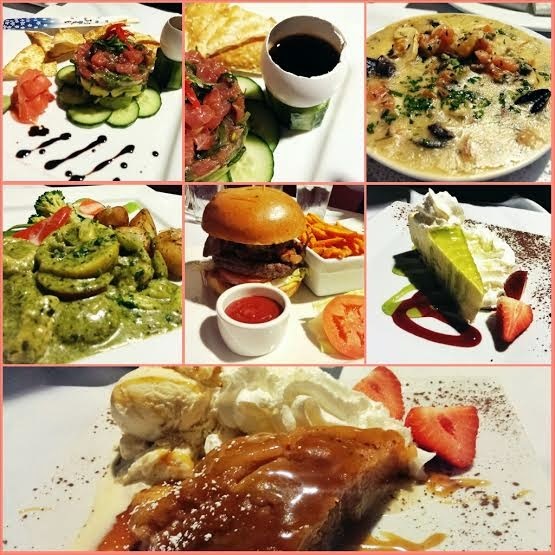 If you're looking to have a casual dinner with a right amount of class, Bernard's Bistro is a great place to eat at!